So I got inspired by events from the past week and a presentation I saw today, so all those things I said I’d talk about I’m either working into this framework or putting off even more. Actually, the knee and the food allergy are both waiting on doctor’s appointments in June, so there’s not much more to update there anyway. So what caught my fancy, you ask? Much like I’ve been asked why I run by various people over the years, I also get the question as to why a (now) 33 year old man would enjoy playing board, card, and video games. Actually, that’s not entirely true, as the running question was often verbalized, while the game question often was conveyed more by look or sigh. Since we just had my birthday I requested what is fast becoming one of my favorite traditions, a birthday game slash hangout day. Come when you like, leave when you have to, participate in various games if you want, and have good conversations if you don’t want to game. I, being birthday boy of course, got to sit in on all the game sessions (actually, this time, it was largely the same crowd that played games while everyone else talked). We played Space Fluxx, Forbidden Island, and the new DC Deck-building game I bought myself as a birthday present. I also got to play a few more games in the ensuing couple of days as we had house guests and one was willing to play a few games with me in the evenings (the DC game some more and the Star Wars card game that my parents got me for my birthday – yes, I asked for it specifically, that’s the whole point of this post, remember?). Actually, I’m going to detour for a paragraph here to talk about our guests, so if you’re just here for the games you can skip on by. Yup, for two consecutive weekends (with a stay in Anaheim and Carlsbad in between) we had our friends down from Alaska with their two kids. I will say this, fitting four adults and two children into our condo worked far better than I imagined it would, and the cat actually behaved fairly well both with the visitors and at night when we had to sequester him in our room. We had a lot of fun, especially with the little ones, and it actually encouraged me to maintain a decent bedtime, although that quickly went out the window once they left. We got to spend some quality time with our friends, but also allowed for plenty of family time so Jess and I didn’t feel overwhelmed with constant visitors, and attended outings to Disneyland and the beach. The kids were adorable and well-behaved, even if the youngest one’s default setting seems to often be pout (although it is the cutest pout ever). We miss them a lot and were certainly glad for the visit! So why do I like to play games so much? Why don’t I feel that games are beneath me; a childish pursuit? Whether they be board games, card games, or video games, it all come down to one things: problem solving. 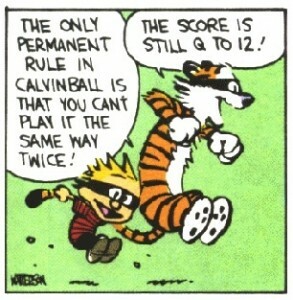 Games all have a set of rules (well, except Calvinball, that only has one rule “You can’t play the same way twice”) to play by and your job, as a player, is to use those rules to win the game. In a fairly new twist there are now games that require all of the players to try and beat the game itself, which are called cooperative games. We played one at my birthday party and had a blast as we barely beat the game and had some great moments of suspense and strategy. What is it about problem solving that is so important? Well, for me, it represents a challenge to which I enjoy figuring out the answer. It’s actually the part of my day job that brings me the most fulfillment, when there is a problem and I have to figure out the solution. By bringing that experience out of a work situation and into one that is leisurely and generally involves some good friends, well one can hopefully see the appeal. When I draw my opening hand of cards, see my initial board position, or drop into the first few seconds of a video game, my brain instantly starts to analyze my options and formulating a game plan for success. Success does not necessarily mean victory, I play enough games that I know I can’t win them all (which helps me be a gracious loser), but I want to be competitive and put myself in the best position to bring home a victory. I have a couple of shortcuts that I’ve ingrained myself with so that I can play any game competitively the first time I read the rules. 1) Amass resources: This goes particularly for card games where you aren’t trying to be the first one with an empty hand (those obviously have the converse rule – dump as quickly as possible), when the goal is to achieve a certain combination of cards to achieve victory, the more cards you see the better. This has led to what have been dubbed “Matt turns” in games like Fluxx, where I play in upwards of twenty cards over the course of a couple back to back turns in search of the winning combination (this has been eased recently in light of I recognize how annoying it is and the newer versions of Fluxx have done a better job of mitigating my ability to do so – now it typically tops out at about ten to fifteen). In card games where I have the choice of my deck construction, I will generally put as many cards that say “draw a card” in addition to their regular text as they will let me in the deck. More is definitely better in these cases. 2) Be patient: Don’t just play cards or move simply because you have them left. If the game allows you to keep items from turn to turn, then save some for when they may better suit you in the future. You can’t have ten to fifteen card turns in any game if you don’t keep a way to get more cards in the future from hand to hand. The exception to this is the endgame, where you know that anyone could possibly win the game at any minute. This is the time to throw everything against the wall and see what sticks. 3) You’re going to lose: Some people just don’t seem to get this and this both makes them very difficult to play with (for the other players) and less likely to continue playing games (for that player). The funny thing about games is they are just like anything else in life, the more you practice, the better you are. It’s cliche now, but it’s still true: you learn more from defeat than you do from victory. Even if you win you can look at what happened with the other players, did they make any mistakes of which you were able to take advantage? If so, then you know to avoid those mistakes when you are playing. Sometimes going into a game knowing you don’t have a chance can take a large amount of pressure off and allow you to focus on enjoying the experience of the game, which Jess and I were able to do recently (uh oh, I feel a sidetrack paragraph coming on). While we went to Disneyland with our friends last Monday and Tuesday, we were actually there on Sunday for an entirely different reason. After having asked me for the last several events Jess was able to convince me to sign up for one of the MouseAdventure scavenger hunts through Disneyland. Her usual partner-in-crime was unavailable due to having to take another leg of one of those nasty accounting tests, and Jess REALLY wanted to do one with me. You might remember from my secret project last year (and Jess’ birthday party a few years ago, although I’m not sure I’ve blogged about that one) that I am no stranger to scavenger hunts, and Jess wanted to see if my experience (as well as all the reasons in this post) would couple well with her Disneyland knowledge. About 900 people participate, some of whom are Disneyland Cast Members (MousePlanet, who hosts MouseAdventure, is not Disney owned, thus they are eligible to play), most of which play in four-person teams (Jess discovered the first time that she prefers playing with only two people, less personality conflicts that way), and some of whom simply have ridiculous amounts of Disneyland knowledge (much like my ridiculous amounts of other less-than-practical knowledge). Up against all of that we didn’t pressure ourselves to win, simply to do our best and to finish as much as possible. Well, actually, we did have a bit of a competition going, as two of Jess’ students played as one team, and one of her faculty members played with her family as another, so there is a bit of intra-departmental rivalry there. While the scores aren’t up yet (any time now), we were very happy with our progress and only yelled at each other once the whole day (this is where Jess’ first time-developed pre-apology worked wonders, you just apologize for everything at the beginning and then move on when that kind of stuff happens during the game). We managed to get an answer for every quest (although we think we were wrong on one of them) and completed a good portion of the bigger quests. It was a lot of fun and, if it wasn’t for their propensity for hosting these things on Sundays during church sports seasons, I’d consider playing again. Ahem, where was I? Oh, right. 4) Look for combinations: Whether it is combinations of moves or card combinations, some things just work out to be better than the sums of their parts. If it is a game you are going to play often, take some time to look at the rules really closely and see how the game elements interact with them. Sometimes the combination isn’t on the cards or with the pieces, but how those elements interact with the rules that are so powerful. Generally if an element allows you to break one of the fundamental rules of the game, then it’s going to be a pretty powerful effect. When you can construct your own deck, look for combinations that compliment each other and further your goals. Our last go-round with the DC deck building game I had a character that let me draw one card a turn when I played equipment, which I then complimented by picking up several copies of an equipment card that let me look at the top card of my deck and destroy it if I didn’t like it. This let me see what my next draw would be and replace it if it was something I didn’t like, which allowed me to thin my deck to my most powerful cards and, when I picked up another few copies of an equipment card that made the victory conditions cheaper, quickly burn through to the end of the game. A couple synergies combined into one really powerful effect. 5) Don’t be afraid to take risks: You thought I just threw that into the title to make it match my running post? It’s a game! Couple this one with number 3 in the list, as there are generally no consequences to losing a game. It’s also why I can have fun at games where the accepted strategy for everyone else at the table is “Get Matt first.” Being the target leads to the development of more risky strategies, as you don’t have time to sit back and develop things when everyone is targeting you. It makes victory all the more gratifying and defeat all the more interesting. I’ve long since stopped taking that strategy personally by the way, because I realized it meant that I had been so successful in the past that I warranted the attention. Even if you are playing a game for the first time, or have been playing the same game for a long time without much success, adding some risky elements to your play makes you unpredictable and my open up some avenues that you had not yet explored and could potentially make you more successful. I could probably go on at length, but without direction it might devolve a bit (no cracks about it already devolving). If there are more specific questions feel free to ask here or if you see me in person. Of course, that also assumes you made it this far. If you skipped down here from the middle, well, that’s fine too. And that is why I continue to play games of all types even as I approach my mid-thirties, and will continue to do so for as long as I can. Each game is a puzzle, one that can bring great gratification while not exposing myself to unnecessary risk. We will often play games when we visit my parents for dinner, usually versions of Dominoes or card games like Hand and Foot, and we always have a lot of fun regardless of who wins and loses. In one of the games (we keep a record) I have both the lowest total game score record and the highest single hand record (like golf, high is bad, in fact the single hand record is higher than my lowest total game score record), and I’ve learned to take pride in my epic failures as well as my epic wins (just a little more in the wins, but only a little). As for the mortality part: well, the great thing is that in most games if you die (metaphorically of course) you simply get to restart, often just a little bit wiser. Posted in Matt 2013-52, Matt General. Tagged with board games, card games, games, insight, long, mortality, problem solving, risk taking, rules, steps, video games. I thought, *thought*, this would be a quick week night dinner to try. Basic pancake batter with a cinnamon-sugar-butter swirl, how hard is that? Pancakes were a piece of….nevermind, they were really easy. The cinnamon-sugar mixture wasn’t hard either, the problem came with putting it on the cake. If you have ever made blueberry pancakes, then you know the easiest way is not to add the berries to the batter, but to put plain batter in the pan and as one side cooks, sprinkle some berries on the still doughy side, then flip. These work on the same idea. You put the batter in the pan, then do a swirl of cinnamon-sugar mixture, then flip. Sounds easy enough. Nope. She writes in the blog that you have to get the mixture just right, letting it sit at room temperature, mixing it up to keep the butter mixed in…all that. I still could not get the mixture to come out of the bag without glopping all over or clogging because it was too thick and not coming out at all. That was problem #1. Problem #2. When you flip the pancake to cook the other side… well there is this thing called gravity. Flipping them is easy, but once you do… your lovely swirl that you work painstakingly hard to get out of the stupid piping bag then goes on to pan. Butter and sugar do one thing very well together… caramelize… which can be yummy and wonderful, it’s also approximately half a degree away from BURNING. This does leave you with a really, really cool gap in the pancake since it holds the “Swirl shape”. But this also means that my pan is now covered with burnt butter and sugar what was previously in my pancake. I mix cinnamon, sugar, and butter together, I want to eat it! Not spend 20 minutes soaking it off my pan. I made 6 in total, topped with the cream cheese glaze, and took a picture of the prettiest ones for the blog. Grumbling and cranky at the whole thing, I finally take a bite. 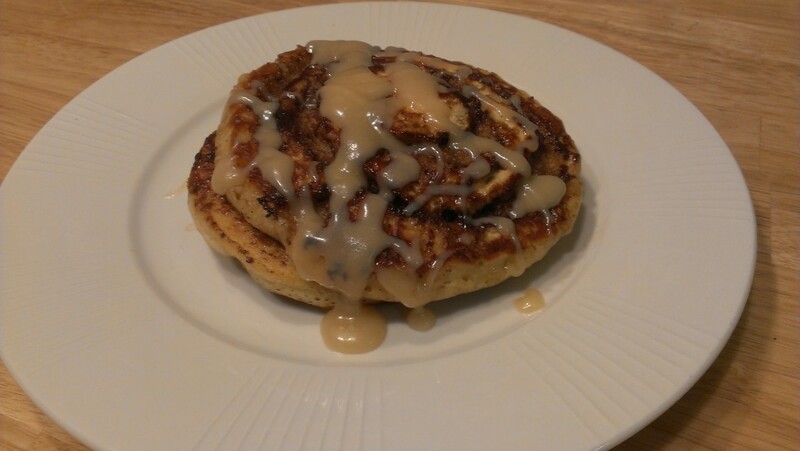 They were good, and they did taste like cinnamon rolls despite the layer still on my pan. Texturally, the gap made by the escaping filling was actually pretty cool. Matt turned to me and said, “You know, these are pretty dang good.” “No they ar… … …Yeah, they are dang it. Still, don’t get attached! !” Then I spent the next 30 minutes cleaning my kitchen…. Posted in 100 New Recipes, Jess General. Tagged with breakfast, Breakfast for Dinner, messy, not worth it, pancakes, Recipe Girl. I mentioned this on facebook a couple weeks ago, but this has become a favorite Saturday snack for Matt and I. First you wash and “de-string” the peas (breaking off the end and pulling it down the side. It just makes them easier to eat). I throw mine on my grill pan, you don’t need to use any oil. I let them go for a couple minutes flipping them when they begin to char. You want them to be cooked but not soft/mushy, so don’t go too long. While they are cooking you make the coating. This is where I had to take some liberties. I remembered to buy the peas, but nothing else, so I had to use what I had on hand. Instead of lemon juice, zest, chili flake, and mint, I used lime juice and zest, chili powder, and cilantro. Once the peas are done, toss them in the juice/spice/herb mixture and season with some Kosher salt. This is a perfect TV snack! You eat it like you would edamame, using your teeth to take the peas out of the pod, it slows you down so you aren’t mindlessly eating. They are salty, spicy, and acidic so they hit all those same flavors that our normal salt and vinegar potato chips would. You can eat the entire plate and it’s less than 200 calories (I’m guessing that I’m over estimating here honestly). Not to mention all those wonderful healthy things that green veggies have to offer. I started to make a joke about “vegging out” in front of the TV… but decided against it (you’re welcome), but I think that goes to show exactly how tired I am! Posted in 100 New Recipes, Jess General. 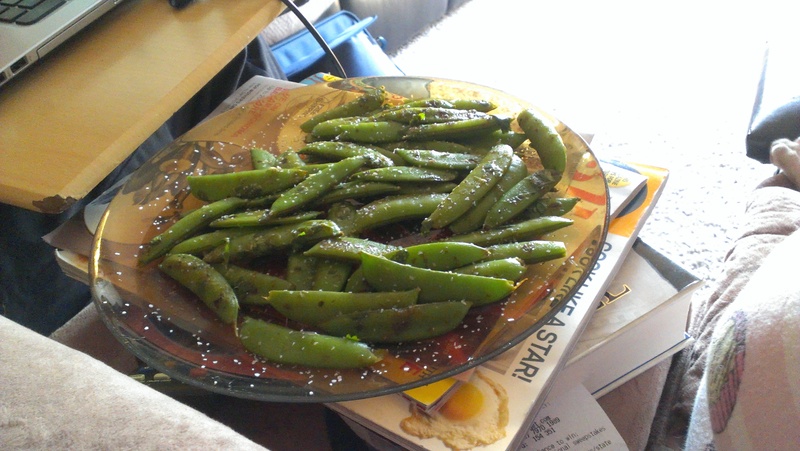 Tagged with healthier choices, healthy, lime, Michael Symon, peas, snacks, The Chew. Last possible day, last possible minute, this is starting to feel like when I was doing the daily blog last year. I had my birthday this week and a lot of decompressing, including a great party with great people today. All that said, this is going to be another short one. I’ll catch up next week, as I have even more items to discuss, including my first Disneyland scavenger hunt (which is good, the results are due tomorrow). But for now I’m going to use the celebration of my birth (which I’ve kind of been celebrating all week) as an excuse to just take it easy. Posted in Matt 2013-52, Matt General. Tagged with birthday, Disneyland, rest, scavenger hunt. You might think that after putting together over 6000 words on Ragnar I might have burned myself out on blogging, and that’s why this post is so late (and probably short). Sadly, you would be mistaken, as I think I’d rather be burnt out on blogging rather than having zero time for it this week. Yeah, it’s been a crazy week at work and at home, and I just haven’t had time to sit down and write. Which is, of course, why I’m writing at 11:50 on Saturday night. I’m sure I’ll get into it more later, but we had a outside company coming in this week for a project to update our imaging software, so my work time was taken by that. My home time was taken up by grading twenty seven 2500 word papers for my class so I could get it back to them by the time they took their final yesterday. And the rest of the time was me being a zombie. I’m sure there’s more, but I’m running out of time and brain cells. Also, the May resolution update will be folded into the June one. Actually, looking at the list above, it’s kind of sad, so maybe I’ll just jump to new topics anyway. Who knows, anything could happen. Yeah, I think that seals it, I’m gone. Hope everyone is doing well! Posted in Matt 2013-52, Matt General. Tagged with burnout, grading, tired, work. So when we last left Van 2 was out on the course and my van, Van 1 was heading towards the area of our next major exchange and was looking for some grub. Greg and I, from having the major exchange in the same area last year, and Tom, from living in the area for a decade or so, knew that there were no food places local to the exchange point, so we continued down the freeway until we found the next major shopping center (only a couple miles). A promising area emerged, so we wheeled into a parking spot and prepared to go our separate ways for food. Unfortunately it turns out that the shopping center had felt the effects of the economic downturn and half the food places were closed. Most of us found our way into a very busy and understaffed Juice It Up, where we sated our hunger with smoothies (wait, can you do that?). I also had a terrible reheated pretzel, but I was invoking Disneyland rules for this trip. Oh, right, you’re probably going to want me to explain what Disneyland rules are (unless your my friend on Facebook and happened to see my post that day). My rule at Disneyland: eat everything in front of you at every meal, as you never know when you’re going to get to eat again. (The addendum to that at Disneyland is: It probably also cost you an arm and a leg, so get your money’s worth.) There, aren’t you glad I explained? We still had an hour or so to wait until it was our turn to resume the festivities, so we decided to wait at the exchange. Every year there is one major exchange that wins the award for worst setup and parking, and this one won it for 2013. We wound up parking in another parking lot down the street after orbiting the completely full one next to the exchange (which we wound up being evicted from about the time I was heading up to wait for our runner). Tom, being familiar with the area, said he used to come down here and run, and I should get a nice tailwind for the majority of my run. While my first run had only one turn, a left from the beach onto the wash trail, this run had a grand total of two(! ), a right and then a left in fairly close succession at the beginning of the run, otherwise it was six miles of straightaway. Here’s where I make a quick sidebar for the best joke of the trip. Understand that this was the best joke in a van of five sleep deprived guys and one woman (who for reasons I will explain later was better rested than us men), so it’s pretty bad. In fact, it’s probably not worth the sidebar. But I still laugh thinking about it, so here you go. At one point in all of our navigating the area around the I-15 and Lake Elsinore, Danny turns to Tom and asks, “Are you the Thomas from Thomas Guides?” to which Tom immediately replies, “No, I’m the Tom from Tom-Tom!” Thus was Tom called Tom-Tom for the rest of the trip. Why the sidebar? Well, I received the slap bracelet and started my run, appropriately taped up now that I had time to prepare for this one. About an eighth of a mile in I reach the first turn which is across the street, and I had to wait for a light . . . the longest light on planet earth. It felt like five minutes at least, which probably meant it was two and a half to three minutes, and we accumulated a few runners waiting there since it was a large, fairly busy street. Finally we get to cross and I turn right . . . into one of the strongest headwinds I have ever experienced. It was hard to move forward, let alone run. I made a point to mention to Tom-Tom later that while his navigation was generally spot on, his weather mode wasn’t very accurate. After another quarter of a mile I made the left turn and proceeded down the straightaway, with the wind coming across and whipping around occasionally rather than being steadily at my back. Despite being straight, this was actually the most difficult and mentally challenging of my runs, as it was just a continuing rolling hill with more up then down. I’d crest one hill to see a short decline and then the start of the next hill. Despite very much wanting to stop and walk multiple times over the last couple miles I managed to force myself to the hand off, where Danny and I completed our only successful one motion slap bracelet transition. And there I was, already two-thirds of the way done. Evening was fast upon us, as I was the last runner who started during the daylight hours and thus did not have to wear a reflective vest, headlamp, and tail light. Night hours ran from 6:30 pm to 6:30 am, though, so it was pretty much guaranteed that I’d be wearing the gear come my last leg. Everyone else’s leg went pretty smoothly, aside from Tom-Tom’s only major navigational error that put us on a winding two lane road with no opportunity for turning around that took us a couple miles out of our way. We decided he just wanted us to see both Indian casinos in the area so we could compare, and we still made it to the exchange in plenty of time to meet our fastest runner Manny, so we didn’t give him too hard of a time (uh, right). Our legs took us well into the night, and by the time we sent Kristin off on her leg it was right around midnight. Thankfully it was pretty much straight downhill and there were plenty of people running as well. We passed a long string of blinking red tail lights and also a camper. Well, plenty of other vans too, but the camper happened to be parked off to the side and also happened to contain Kristin’s husband Rick, who had driven down to meet us after he finished work for the day. We all met up at the next exchange and sent Greg off for the final leg of our second round, a brutal uphill climb to the Welk resort which was serving as the halfway point like last year. Whereas we spent last year sleeping on the side of the golf course, this year we split a suite so that everyone could grab a shower and some shuteye. Since we had five guys and one girl in our van (compared to van 2’s four women to two guy ratio, and the two guys were married to two of the women), Kristin asked if it was okay if she stayed with Rick in the camper and then met us at the start of her final leg. I knew it wouldn’t be an issue and also envied the fact that she’d be able to skip the three am wake up call. I agreed to text her when the runner ahead of her was underway, which would probably be closer to eight or nine in the morning. 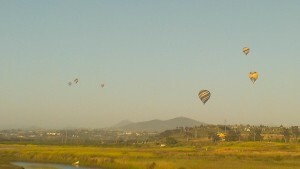 The men (heh), however, had to get moving up to the resort. Lynn was kind enough to put my name on the room, so I was dropped at the front desk and acquired a key and towels. Greg still had at least twenty minutes left in his leg, so we made our way to the suite and met the second van loading up for their leg. They raved about the place and I walked in to see why. It was bigger than our condo, with the front door opening into a dining area with the living room behind it, a giant kitchen which stretched to my right and back a ways, and a bedroom and bathroom on the left side and the right side. By the time I had remembered everything from the car and had seen off the other van our first member was in one of the showers and two others had decided to go retrieve Greg from the exchange point down the hill. With that taken care of I claimed the other shower (which alone was bigger than the bathroom at our last apartment), got changed, and then climbed into one of the two beds in the bedroom on the left side, shutting the door but not latching it. I heard the others return with Greg, set my phone to turn the ringer back on at three in the morning, and eventually drifted off for a little sleep (seeing as it was nearly one in the morning already). I awoke to the door being thrown open and Tom loudly telling me to wake up. Apparently, and extremely unsurprisingly, his first two gentle attempts to wake me had not done the trick (once I get to sleep, I generally sleep like a rock). I also heard him say, “Hey, there was another bed in here?” A fact that I later pointed out he knew, but apparently in the haze of everything they forgot and so two people shared the couch bed and I ended up with the room to myself. Not that it mattered, since we all only got a couple hours of sleep anyway and we were all tired enough to sleep where we fell. It was ten until three and I saw that I had missed a phone call from Lynn, who had apparently tried me (didn’t answer due to the volume not yet turning on), then Danny (who did answer but did not sound sufficiently awake), and then finally Tom (who wound up getting the rest of us up). I woke up fairly cranky, complaining about the shorter time period we had in the suite (sadly for us, it broke that they got the suite while we were running 44 total miles and we got the suite while they were running 22 total miles), and it took me the drive over to the next exchange to get back up to speed and back into the proper mindset. Thankfully I don’t talk much when I’m tired, so I don’t think too many people noticed (aside from my complaining on Facebook, which I retracted later). We pulled into the exchange with a few minutes to spare, but not enough time for me to find my head lamp (which showed up when I unpacked afterwards, of course). I instead grabbed the small, ultra-powerful flashlight I brought and ran with that instead, which worked just fine. My final leg was positively windy compared to my first two, I had to make five (gasp!) turns. It was nice and cool around four am in Carlsbad, so I was able to run the last leg with minimal discomfort, my knee still taped from the second run. I was definitely counting down the last few miles, but was unwilling to stop and walk seeing I was so close to the end and accomplishing running the whole thing on a knee that required a lot of rest and tape heading into the event. My final pass once again bounced off Danny’s wrist (apparently I don’t have enough practice with slap bracelets), but he was kind enough to retrieve it and head off into the night. We managed the rest of the legs fairly well, with Kristin and Rick beating us to the exchange point for her leg in plenty of time. We started looking for food and coffee during the third runner but were always stymied by location, hours, or a detour every place we went. We finally pulled into the final major exchange before the finish at the Torrey Pines glider port, a place we had the final major exchange at last year but I couldn’t remember for the life of me until we were somewhere around the Welk Resort (oh yeah! The big dirt lot!). It is serviced by one two lane access road which got pretty bogged down by vans, just like last year. We handed off to the second van for the final time and went to make our way out of the lot when we were stopped at the entrance. A fire truck came out of the line down the opposite side of the street, pulled a fifteen point turn in front of us, and then headed back out the way we were going. We followed it and then prepared to finally acquire the food we were desperately desiring at this point. I had taken the food reins as van captain and someone familiar with the various joints in San Diego. Originally I was going to point the van at Hodad’s in Ocean Beach, since the course went right by the front door, but I found out a couple days before that they were going to be closed from 11 am to 5 pm that day. I never found out why, but did know they were filming there a lot that week, so maybe it was related. I had heard of a couple breakfast places when Jess and I came down the week before, so I suggested them. One of the van members had been to the Broken Yolk and wasn’t impressed so we instead headed towards the Hash House, which was only a few miles away and in the general direction of the finish line. Everyone else seemed to have the same idea since it was now mid-morning on Saturday, as when we drove by the front door the line wrapped back on itself several times over. We were hungry now, so it was time to fall back on other options. Jess and I have a favorite pizza joint in San Diego, Pizzeria Luigi, so I plugged it into my phone and found out we were just over a mile from one of the two locations. We pointed the van in that direction and a few minutes later made a right turn onto a small street with a restaurant on our left . . . a Mama’s Kitchen or something like that. I looked at the GPS and verified we were in the right spot. This marked the fifth or sixth time we had been denied food in the last few hours and we were getting cranky. Right before we turned onto the small street we saw that the street ahead was being blocked off for a street fair of some sort. We turned around joined back on the main street towards the festival when someone in the back said, “Hey, Pizzeria Luigi!” Yup, it was just around the corner from where we were directed. I don’t know if it moved or we were being directed to the back door. We drove past the street fair to loop around and discovered it was a beers of the world festival, which peaked the rest of the van’s interest. It took us a while to find parking due the fair, but having done so we trekked back to the pizzeria. And it was soooo good. I got the meatball roll that Jess and I love so much, but unfortunately takes a while to make. Pretty much everyone was done with their slices by the time I got mine, but they were still enjoying their various beverages and we weren’t in a hurry to go anywhere. Danny wound up ordering one too after putting away a couple slices, and we were all able to relax a bit. It was determined that when we left it was no longer necessary to check out the festival, we were satiated. Someone suggested we find a park to rest at like we had earlier and I remembered that the finish line was at the park we could see from our hotel the week before, so I suggested we just head there. It would be a few hours yet before van 2 would be at the finish line. The finish line park fit the bill perfectly and we actually got to park in special lot due to the Excursion with the roof rack not fitting in the underground parking. We checked out the festivities a bit and then decided to rest in the shade at the edge of the park by the water. It was pretty awesome and most everyone dropped off to sleep for a while. I, of course, still have trouble sleeping during the day, and it turned out that Greg did too, but I had a flash of inspiration as to what we could do. I remembered that the last two legs of this year’s relay were actually combined into one last year, my infamous eleven mile leg. I also remembered that square in the middle of that leg was two giant hills that stretched for a mile. Why don’t Greg and I drive over and encourage that leg’s runner (it turned out to be Stacey) up the hills. When Greg heard about this and we realized who the runner was it turned out that they had dated for a couple years and Greg knew that she HATED hills. We had the plan and the destination, now we just needed the keys. Danny proved a little more difficult to rouse than we expected, but we secured the keys and started to make our way to the hills (or, as I called them last year, San Francisco in San Diego). I knew if we just tried to trace the legs backward that we’d be square in the teeth of downtown San Diego traffic, so I directed us back out along the edge to the freeway and cut back over to the general area that way. Our route actually landed us at the end of the mile of hills, so we got to drive through them back to the beginning and Greg got to see exactly what I was talking about. I was much happier I was in a car this time and not running them. We hadn’t seen Stacey yet but were pretty sure we hadn’t missed her and, sure enough, we got to the base of the hill, turned right, and there she was running toward us on the other side of the road. Thankfully despite the fact that the area is still hilly it’s still laid out in a grid, so we could just move over one street and then cut up and criss-cross the route or drive along it depending on what we needed. Technically this part of the course was “No Van Support” which meant we couldn’t get out or give the runner water or anything, but that wasn’t our plan so we were still within the rules. She didn’t see us at first, nor the first time we stopped on an adjoining road, but when we parked at the summit of the first hill and waited I got to see an awesome double take as she realized who we were. We waited a little bit and proceeded to the top of the next hill, surprised at how well Stacey was killing it, we only beat her to the top by a little bit. It was as she was passing that I realized she was holding something out to the car. I reached out from the passenger side and came back with her sunglasses, and she kept motoring on. I made note to ask why she wanted to get rid of them later, as it was quite sunny out. 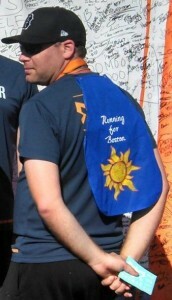 I turned in one of the group pictures to show off my cape. I actually wore the cape during my first run too, just to get everything off on the right foot. I was the only one who pinned it though, everyone else tied a loop and wore it true cape style. And that was it, we crossed the finish line together around 4:44 pm in a far better time than last year and a better time than we were projected to based on our paces. We celebrated, took pictures, distributed the medals, and then grabbed two lukewarm Dominoes pizzas (but they were free and we were hungry, so they were awesome). I asked Stacey about the sunglasses and she said that they kept slipping down her nose and she was tired of pushing them back up and would rather squint, which made perfect sense to me. We took one last tour through the swag tent, packed everything up and headed for home. 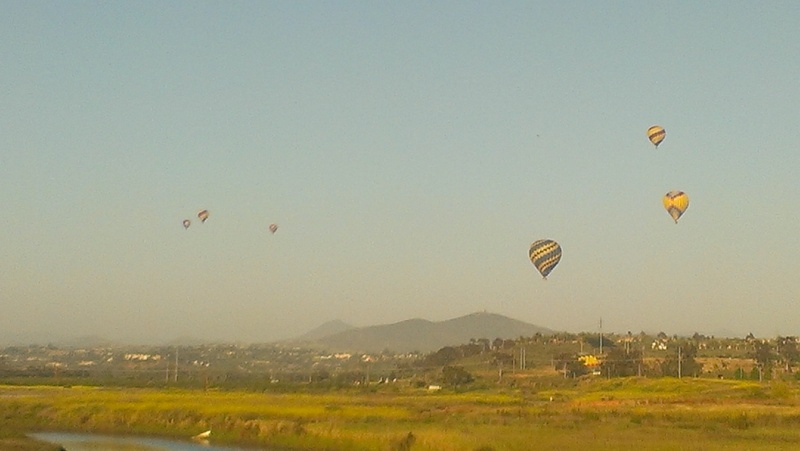 I’m guessing they were from Temecula, and it sparked interest in a group of friends going to a balloon festival at the beginning of June. As for the van, we made it back the church safely, dispersed to our separate cars, and went home to sleep. Posted in Matt 2013-52, Matt General. Tagged with 2013, Better Than Last Year, Part 2, Ragnar Relay, Runner 1, running, socal, Van 1. Every once and while you talk with a friend and you know exactly what you can do for them in a moment of frustration. In this case it was, “Okay, I’m demanding that you drop the kids at my place tonight for a couple hours.” Sometimes, you just need to have a couple hours with your husband to talk, vent, cry, whatever. That is hard to do with 3 kids under the age of 7 under foot. So the kids, A., M., and E. were left to spend some quality time with Aunt Jess. Matt had already decided to go to a movie that night so it was just the 4 of us. We ate dinner, talked about foods we love and foods we hate, why hot fish is apparently the opposite of cold pizza (?? ), and what to do for the rest of the evening. Me: Well, since we just decided to hang out tonight, I had something I was planning on doing before. Do you think you could help me with it? Me: Well, I have this project I am trying to do. Before Christmas-time, I want to try and make a 100 different foods! A and M: WOW!!! That’s CRAZY!!! Me: I know! So tonight I need to work on my project, do you think you could help me make some brownies? They for some reason did not hesitate to agree to help. By the way, I really kept trying to call them “special brownies” all night but catching myself. That’s all I need, for A and M to tell grandparents they helped me make special brownies. Yep, pretty much chocolate awesomness. The best reaction though, may have been from my bosses daughter the next day. Things have been so stressful at work that I brought some in for us to enjoy. True to Leta’s character, she took some home to her kids. I got a text message that night from her saying that her daughter had to tell me THANK YOU and they were “rhapsodic”. The next day I was told she had never seen her react to food like that. Her whole family in fact. I will say that I think the ingredients I used did have something to do with those reactions though. So I would recommend using those to make these. 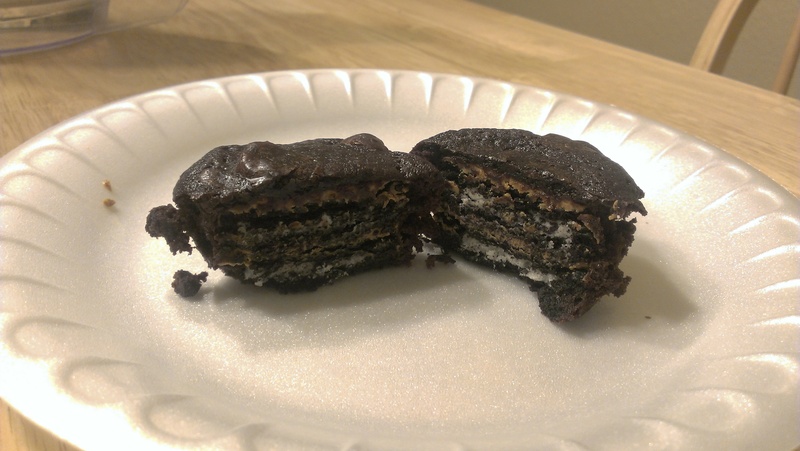 Overall though, we’re talking brownie, oreo, and PB… how could that EVER be bad? So to recap, an evening at Aunt Jess’ consists of Veggie Tales, popcorn, root beer, and brownies with oreos and PB…. because that’s how I roll. Posted in 100 New Recipes, Jess General. 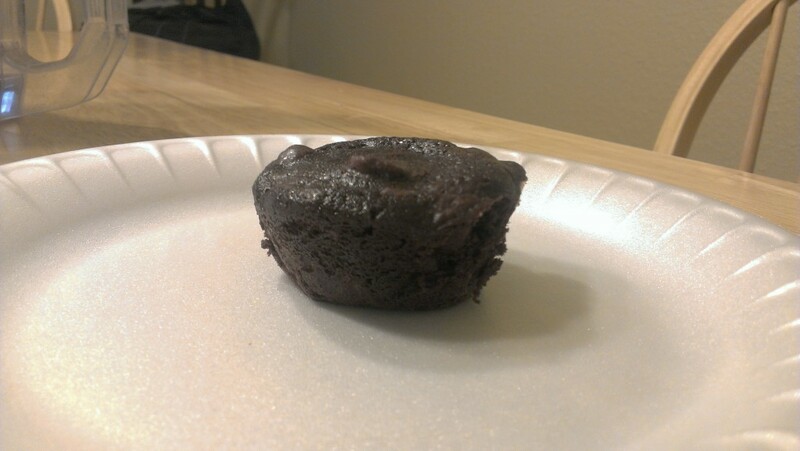 Tagged with Brownies, chocolate, cooking with kids, cool aunt, desserts, kid friendly, Oreos, Peanut Butter, Picky Palate. Short review tonight. As much as I loved this recipe while eating it, a long work week as apparently broken my brain and left me with little to say about it. Growing up, my dad had this one dish he would make that was his. He could copy mom’s recipes, or follow back-of-the-box type of stuff, but for whatever reason Oven Fried Chicken was dad’s specialty. This recipe is not as good as his, but for the several I have tried since getting married, it’s the best one I have made. Using the “Shake and Bake” method (Matt helped!) it didn’t take long at all to get into the oven. The recipe itself calls for Progresso Italian breadcrumbs (which is actually what dad uses if I remember correctly), but I only had plain panko. Not wanting to make a special trip to the store, I just added some garlic powder and Italian seasoning. I think I actually preferred this to the finer Progresso crumbs (Sorry, dad). It made them super crunchy, even more crunchy than most fried chicken! 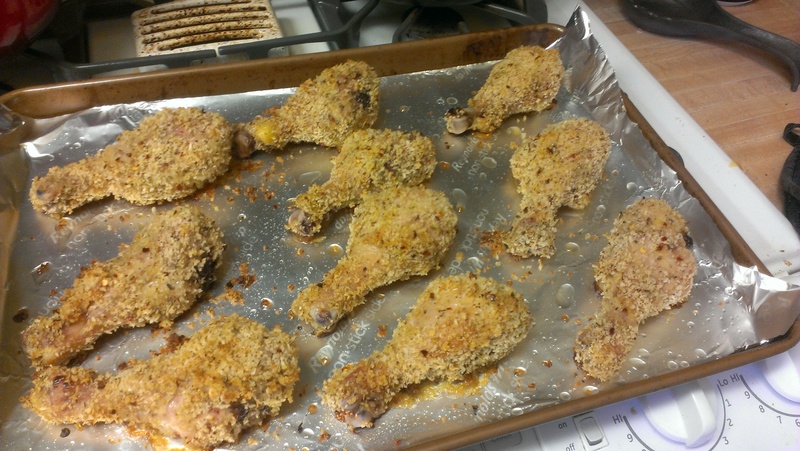 Given that I just bought something like 8lbs of drumsticks at Costco, you can bet I’ll be making this again! Posted in 100 New Recipes, Jess General. Tagged with Chicken, Easy Dinner, lighter options, The Chew. I’m not sure why, but a couple weeks ago I had this craving for coleslaw. It was starting to get warmer outside and it sounded so cool and light. 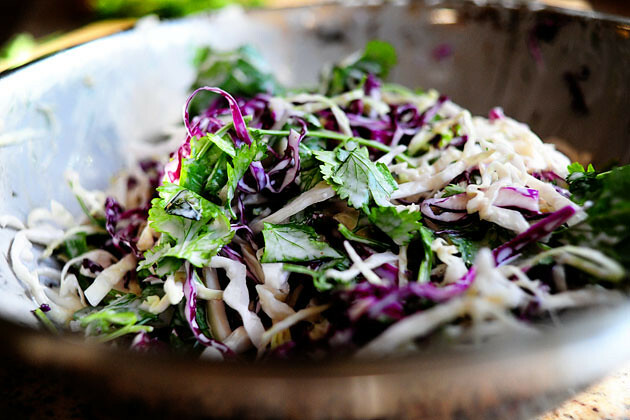 I ordered it out a couple times, but it’s never quite satisfying because the majority of places makes their cabbage slaw with shredded carrots. I have a carrot allergy, thankfully it is not so severe that it will kill me and cross contamination isn’t an issue, but I will get severe ill within 30 minutes of ingesting them. I need to pick through and analyze each bite for stray carrot pieces. Even with all that, there is the nagging fear of what if I missed a piece. I can get away with a couple stray pieces but any more than that I have a reaction. I can never simply enjoy it. So I finally decided to just make my own. This slaw was a great blend of flavors and had a very nice balance, not too tangy, not too spicy, not too sweet. I had mine a top of a hot dog and it was delicious! I’m not a big “slaw dog” fan (carrot concerns aside) because I think most of those slaws are too wet and soggy. This one is cool and crisp so it provides a great contrast. The recipe itself shows it on top of a shredded pork sandwich which also sounds amazing! Matt usually prefers wet and soggy coleslaw (i.e. KFC) but he said he really like this version. This will certainly be a common summer side dish this year! Posted in 100 New Recipes, Jess General. Tagged with cabbage, jalapeno, salad, side dish, slaw, summer, The Pioneer Woman. I ran my first half marathon in September 2009. I ran my first (and so far, only) full marathon in March 2010. That was about the same time that I was approached by one of the people in my life group to see if I could fill in for a team member that had to drop out of the upcoming relay. Having just finished all my marathon training, it sounded like fun. Little did I know . . . Since completing my first Ragnar in April 2010 the stats are as follows: 0 marathons, 2 half marathons (Disneyland Half Sept 2012, Rock and Roll LA Oct 2012), 3 Ragnar Relays (2011, 2012, 2013). Needless to say, I was hooked. If you haven’t read any of my previous Ragnar blogs (and if you click the little tag at the bottom of this post you’ll find there’s been quite a few in the last year and a half) I should probably take a minute to explain what is going on. If you know the drill, feel free to skip the rest of this paragraph. The Ragnar Relay series started 10 years ago in Utah and has grown in to a States-wide phenomenon (with the first Canadian race being run this year). It is a continuous relay, covering around 200 miles (this year was cut down to “just” 195) and being spread over twelve runners separated into two vans of six each. If you are crazy (and I am not yet), you can enter an Ultra team that has only six runners, with every runner doubling up on their legs. There are 36 legs total, each runner running three times. The first six runners start off, then the sixth runner hands off to the next van of six runners, whose last runner hands back off to the first runner in the first van, and repeat until the whole distance has been covered. It usual takes anywhere from twenty-eight to thirty-eight hours to complete, with our teams usually in the low thirties. Yes, this does mean you have people running at three in the morning (actually one of my favorite times to run). I captained Van 1 this year, which basically meant I was in charge of making sure everything went smoothly. That was going to be a challenge at the beginning since I had to get up at four in the morning, and we all know I’m not a morning person. We were meeting at 4:30-4:45 to load up the car (a team member’s Expedition) to make it down to Huntington Beach by our start time of 6:30. It turns out that Huntington Beach is further away than I remembered, even with no traffic, as we were pulling into the lot around 6:15 with several long lines between us and the race start. I was the first runner, so I made sure I had my shoes on and forewent taping my knee in the interest of time; I’d have to do the first leg in the knee brace I was wearing for back up instead. Timeout for a quick aside: this is the fourth year I’ve done the relay and I’ve run a different set of legs each time. The first year I was in Van 2 and runner number 7, the second year I was in Van 1 and runner number 3, last year I was in Van 2 and runner number 9, and this year I’m back in Van 1 and runner number 1. I’ve made it my goal now to run this race for the next eight years and run each as a new runner number (the alternating Vans pattern does not have to be maintained). I’m already a third of the way there! At 6:28 when they called our team number at the starting line and we were a ways back in the third (and final) line with a safety briefing ahead of us after that I made my first executive decision as Van Captain: you people deal with this while I go run! I am well familiar with the safety rules and didn’t really need to be present, so I stripped off my warm ups, changed my shoes, put on my bib, and ran to the starting line. They were running a few minutes late but were about to start things off, when I realized that I didn’t have the timing chip. Now we had never used a timing chip before, but I had been told there would be one this year, so I sent Greg (who had accompanied me to the starting line) back for it. The race started and I hung around the line for thirty seconds or so, then asked the people working the line if it was okay if I started a little late, as I was just waiting for the timing chip. Well, that answered that then. I found Greg heading back to me, about to say there wasn’t one. I told him we were good and started, a little late but on the way. It took a quarter of a mile or so for my knee to warm up fully and I had to run with a water bottle again (see my first run last year, but I still wasn’t going to make the mistake of two years ago), as I didn’t have time to set up my belt, but at least we were out on the course. Thankfully we were running next to the beach and the attendant changing areas/bathrooms for the first couple miles, as the fact that I didn’t go pre-run started to catch up to me and I could take a minute to take care of that around mile two. After the first couple miles, the course then cuts inland and begins the trek towards the Inland Empire (obviously not all on my leg). This initial stab eastward follows a biking/running trail that parallels a large inlet/water body that seems like a giant wash. It is long, straight, very boring, and easily one of my least favorite places to run. It feels like I’ve run at some point in this wash every year, even the first year when the course went started in Ventura instead of Huntington Beach, as my last leg just happened to fall in the same area, but I don’t think that’s true as I’m not sure how that would have happened last year when I was runner 9. I did have to run a different part twice (for a much shorter distance) during my two Disneyland Half Marathons, as the path is how you get from Honda Center to Angel Stadium without getting run over. Needless to say, I am not a fan, but was glad to only be doing a few miles there. Oh, and have I mentioned the smells? You know what, I think it is time to move on . . . The first exchange point was located in a dirt lot that abutted (heh, abutted) the path but required running down a steep hill to get to the chute, which my knee was not particularly happy about. My team was present and I handed off to Danny, not quite slapping the bracelet hard enough and having it bounce off his arm to the ground (we only managed one clean exchange out of three, but oh well). I took my customary few minutes to cool off, change shirts (have I mentioned how much I love the giant Ziploc bags on these things, just chuck all my soaked clothes in there and don’t worry about it), and we were off to the next exchange. Much of our navigation for the first set of exchanges was just along one main street with small side jaunts to each of the exchanges as we were just following the aforementioned wash. We were early to all of our exchanges so no one had to wait in the chute (unlike what happened to me two years ago, ::cough::, not that anyone in my van was on that team, and it only happened once). After sending Greg off (he was runner 6, so the last in our van before meeting the other one), we made our way to the first “major” exchange (where the two vans meet) and braced ourselves to find parking. Major exchanges are always terrible parking, so it was understandable when I missed the entrance to the park due to the suspicious lack of vans. We apparently hit the park at a sweet spot, and actually got a pretty good parking spot. We tracked down the members of the other van near the chute and awaited Greg’s arrival. A little while later Greg came in and Aaron (runner 7) was off. The total time for our legs was right around four hours, and we made our way back to Van 1’s parking spot (about half a mile worse than ours) so that we could see them off and also pick up the van decorations that they had which we would be using to adorn our vehicle. With the goods exchanged we bid them farewell so they could make the next exchange and headed back to our vehicle for some decorating and to figure out what we would do with our downtime. It was about halfway back to the van that I remembered the whole reason I was runner 1 this year, I had to teach! The class I teach meets on Fridays, and that does come into conflict with the fact that Ragnar starts on Friday every year. The first year of Ragnar I hadn’t started teaching at CSUN yet, so by the time I was hooked on it I had to figure out a way to juggle both. My original idea a couple years ago centered around separate cars and meet ups, but that just wasn’t going to work with time frames (and particularly traffic) involved. Inspiration then struck, this is a class that featured an introduction to all types of computing skills, so how about a day where the class met online to discuss online classes (someone find Jenny and point this out to her, as it’s the best example of “Meta” that I’ve been able to come up with). With my trust cell phone as a wireless access point and my laptop to access the online environment, I’ve been able to run several years of successful online sessions from the comfort of a van. Added bonus this year, I had a laptop with a working battery, so I didn’t have to plug it into the van! Of course, this all works better if I remember to do it. Thankfully I did so with a couple minutes to spare and was able to get back to the van and online (with some minor technical difficulties) to kick off class only five or so minutes late. Historically the students have enjoyed the class and claim to have learned quite a bit, especially since I use a feature (online chat) that most professors forego in their class. We wrapped class up after forty-five minutes or so, as they have additional online work in the form of a project I assign them through the traditional class page that they could work on for the remainder of the time. Some of them were having too much fun, and it took a while for everything to wind down. And that is how Kristin got her nickname for the rest of the trip. Coming back from that little rabbit trail: we went to the goody tents, picked up various beverages, looked over the swag tent, where nothing jumped out at any of us, though I already have a bunch of it and they weren’t carrying the sweater I wanted there. Like last year, I wound up ordering what I wanted online with the free shipping code they sent out afterward. Actually, Kristin showed interest in the track jacket, but I merely bring that up to setup something later. After we were satisfied that we had seen everything we needed to, it was back to the van. Since we still had plenty of time before the next major exchange and no desire to proceed further inland until we had to (I was having traumatic flashbacks to the 105+ degree heat from last year, though forecasts put things in the high 80 to low 90’s range this year), we rested on a nice shady hill directly behind our van for an hour or so. Eventually I mentioned that we might want to track something down to eat, so we loaded up and headed towards the next exchange, intending to find some food in the area. Alright, then, nearly 2400 words and we’re only a third of the way through. I’m going to call this one: To be continued. Posted in Matt 2013-52, Matt General. Tagged with 2013, Better Than Last Year, Number 1, Part 1, Ragnar Relay, Runner 1, running, socal, Van 1.